No, I have not yet abandoned this series of posts. 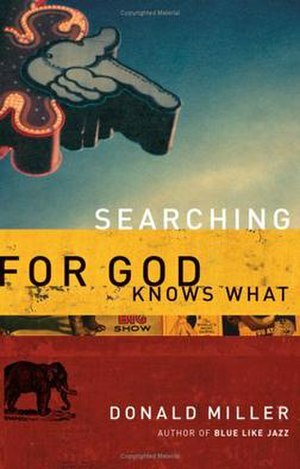 My university had spring break last week and I, fortunately, had quite a lot of time traveling in cars to finish reading Searching for God Knows What. SPOILER ALERT: It’s well worth reading to the end. But you already knew that. Anyway, so I fulfilled my promise to my sister and now only have to make good my promise to you, dear reader. Last time (I don’t want to think about when that was), I left off by addressing Miller’s personality theory on humanity’s need for identification. A short refresher: Everyone is looking for someone to love them and give them an identity. The catch is only God can love us in the way that truly satisfies. We don’t outgrow the social ladder. It stays with us and expands from a playground to the whole world where every person we meet is ranked as above or below us in value. The higher you rank in value, the more love and value you feel, which is why it is important to reach as high as possible to get at what we used to get from God. That is, so we can get what we had before the Fall. We’ve made a ladder of other people to try to escape this pit we fell into with the forbidden fruit. The problem is this ladder doesn’t reach the top of our pit, so even with endless climbing, we will never make it out. We feel a bit more daylight the farther we climb, but we are still plunged in the darkness. Miller relates the social ladder to the problem of people in a lifeboat arguing why they deserve to stay in the boat. Have you ever confronted the hypothetical lifeboat problem (or a variation)? It goes like this: there’s a lifeboat with a bunch of people (let’s say a mom, lawyer, policeman, teacher and rich businessman) and someone has to leave the boat (i.e. drown) if the others are going to make it to safety. Other variations always force you to choose someone to die. These kinds of problems make me feel like a horrible person, so I usually just claim it’s all hypothetical, which makes the point moot, anyway. There’s no way something like that would happen in real life. Miller disagrees, because we’re already living it. Just like the people in the boat, we all need to prove our worth in order for other people to accept and love us. We argue our value to save our lives, because if we don’t feel others affirm our value, we might as well die. It would be prudent to summarize a few ideas that have brought us to this dilemma. If a human being is wired so that something outside himself gives him life, and if a separation from that something would cost him his life (physically, but also spiritually), then a human personality would seek a kind of redemption from a jury of his peers, and a lifeboat mentality would ensue across all cultures. Isn’t it interesting that the “jury of peers” redemption seeking does occur around the world? And funnily enough, we can find in Genesis this idea of separation from the original something that gives life. Maybe the Bible explains the state of the world even more than we know. Just a thought. So I haven’t exactly been posting every week like I promised. I apologize. Really, I shouldn’t be writing even now, but we all know studying isn’t that important, anyway. Right? On today’s menu, I want to share a quote I recently stumbled across. Quotes are addictive, and if you’re the type to collect them, post them on your calendar, give them to friends, write them on your hands and arms, this one is for you. It’s simple enough to memorize. Just four words can’t be that hard. Even so, maybe you should scribble it on a palm just to be safe. But don’t worry too much because you already know the quote. Why do I say that? You read this post’s title, didn’t you? And if you didn’t, you should be ashamed of yourself because you are horrible at skimming. If you fail at skim-reading, here’s a second chance: Pray until you pray. Isn’t it true? We love our routines and habits. It’s easy to fall into the pray-before-eating-and-bed regimen. You mumble a quick, “Bless this food,” before swallowing your dinner or the Lord’s Prayer as you slip into sleep. And that sums up your conversations with the Creator of the universe. But is that really prayer? Well-meaning people have reduced prayer to a formula and have ignored the Master’s warning that the use of vain repetitions is to imitate the heathen (Matt. 6:7). Many books have been written on prayer. Many sermons have been preached in the effort to tell men how to pray. But the crux of the matter is in the simple question: does anyone answer back from the other end of the line? If there is no answer, the fault may be in a poor connection. The wires, so to speak, may be grounded. It may not help to simply “cry louder,” although no one should be ashamed for others to hear him pray and to know that he practices prayer. But whatever the trouble, that trouble must be removed and an answer secured before prayer is really prayer. To him, “pray until you pray” means spending the time and effort to open up and reach out to God. It means making a connection. If you call someone, but the call doesn’t go through because of low reception, can you say you talked to the person? Of course not. The call dropped before the other side could answer. So here’s the situation: pray like you mean it. Don’t go ring God’s door bell and then run off. At the same time, don’t deliver a meaningless speech for an hour to impress your Bible study group or to fulfill some strange prayer minutes quota. Pray from your heart and wait for God to pick up.